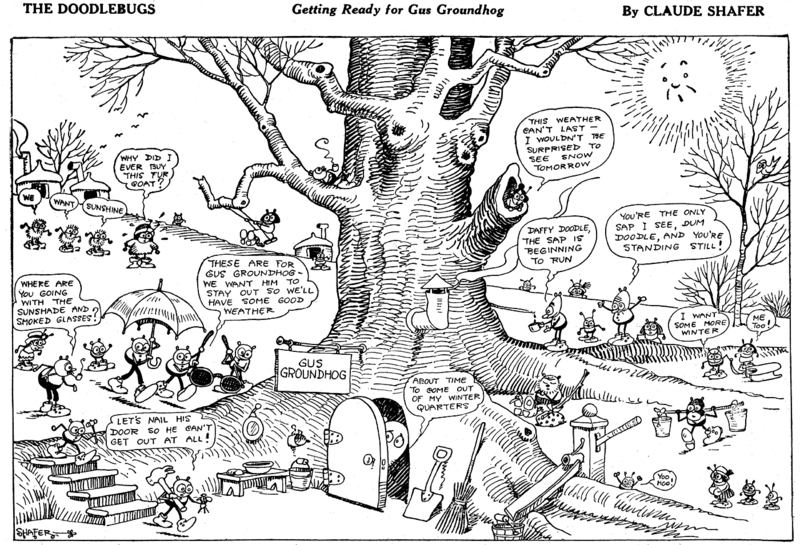 Claude Shafer was a longtime sports cartoonist for various Cincinnati papers, serving for over fifty years in total from the early 1900s to well into the 1950s. He created a mascot character for his sports cartoons called Old Man Grump, and tried to take that character into syndication as a comic strip in the late 1910s with no success. He later tried again with The Doodlebugs, and that was modestly popular enough to last for quite awhile. The Doodlebugs was one of those 'panorama' cartoons that seemed to find an appreciative audience back in the day. 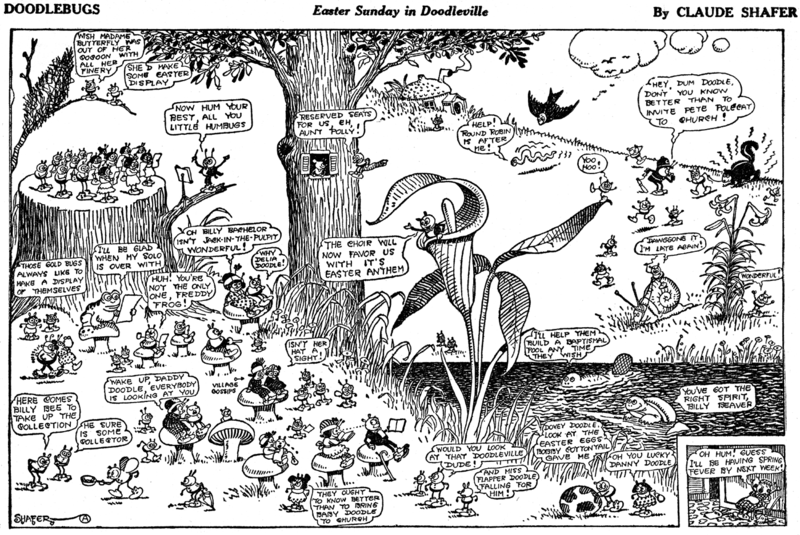 Shafer's page-wide panoramas featured a cast of bugs and woodland creatures. Some of the bugs were of identifiable types, but most were Play-Doh blobs. 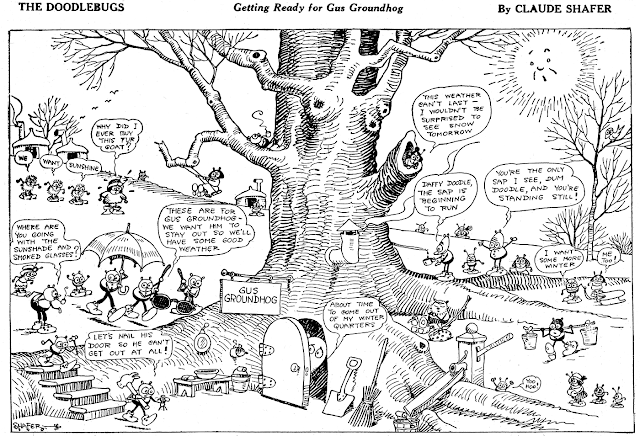 The weekly cartoons typically had a seasonal or holiday theme, and the whole large cast would show up to toss off one-liners. The feature was syndicated by the George Matthew Adams Service starting on July 29 1923* with an episode in which the bugs 'hatch out', and it was marketed as the main graphic attraction on a boys-and-girls page meant for a paper's black-and-white Sunday feature section. As far as I know The Doodlebugs was never offered or used in color comics sections. Although I offer the 1923 date as the start, I found a piece of original art at Heritage Auctions that had a note on it to appear on a Sunday date in 1918 (the note seems just slightly suspicious as a possible later addition), so it could be that Shafer produced the feature for a Cincinnati paper for a long time before it comes onto my radar. The feature is hard to track because it did not merit its own listing in the E&P yearbooks; only the whole kids' page was listed. It seems like the Boys and Girls Page may have moved from George Matthew Adams to Associated Editors in 1927, but that is unclear. What is clear is that about this time the page started rerunning old episodes of the feature. Whether Shafer was personally involved with the feature after this, or if GMA sold off their inventory and someone in the Associated Editors offices chose the episodes to re-use I do not know. All I can say is that I have examples of the feature running as late as 1931*.